Beautifully enhance your table settings with this Choice Crystal 6" clear plastic plate! Boasting intricately-detailed designs on its smooth surface, this plate's crystal-clear construction expertly showcases colorful side dishes and your signature, chocolate-drizzled desserts. Not only does its wide, curved rim successfully frame each dish, it also ensures food and sauces stay contained on the plate to prevent accidental messes. I used these at my wedding for our dessert table. They are plain and elegant, but not super fancy! They are very sturdy and the size was perfect for the dessert table! The price is unbeatable!! The 6" crystal plates were a complete match to the 10" plates and the silver cutlery set. I would buy all of these items over again. These are just the right size and weight for cake. They are so pretty. We can't wait to us them for my daughter's wedding. My daughter loved them. I have to admit, I am not a fan of transparent disposable plates. Transparent glass plates are cheap enough and don't come off as...well, cheap! But, when requested, these are our go to transparent plastic plates. They are highly durable and resist heat very well. We have used, in the past, locally available versions and they warp under heat (say, a fresh omelette). These though, seem to have no issue with normal heat ranges and do not crack nearly as easy as others when slightly bent (read children). Highly recommend these. For the price, I am not sure they can be beat. We have used these plates for a few events, and they look really nice. The design around the edge is really pretty, and they are pretty sturdy plates. We searched locally for this style of plate and were shocked at the price, even at the wholesale company that we normally use for paper goods, tableware, etc. Since we needed such a large quantity of plates for an upcoming event we knew we needed to find a better deal and Webstaurant Store was the place. We bought enough plates for our event and saved almost 75% over the cost locally and at other online stores. The plates are of excellent quality and look very nice, also ordered the larger nine inch plates and were just as pleased with them! Thanks! I am so happy with the quality and design of these plastic plates - they seem like they will be a durable plate for our appetizers. Wonderful dessert plate for the price. If you were to purchase this from most vendors it would be at least 4 times the price. This product is nice and works great. Wonderful presentation. These car some of the best plastic plates that I’ve ever used. They are the perfect size for serving up desserts or salads. One of my clients told me that they just make a table feel a little more elegant. These plates are adorable! Really cute design that can match any theme. They are very durable and can be used for dessert or appetizers in any event (used them for a wedding)! These are the perfect dessert plates for a wedding. When you can't afford real these disposable plates gives an upscale look on a low budget. Nice and sturdy plastic plates. I bought these to have for parties and celebrations. I like to have something nice but it’s freat to not have to wash a ton of dishes! Perfect for dessert time! I have been looking for a nice sturdy appetizer size plastic plate that are reasonably priced and look good. I am extremely happy with these plates. I will be using these for an art opening and they are the perfect size for cheese, crackers, fruit and cookies. I like that they are packed in groups of 20. These are super sturdy and they are the cheapest place to get them! I would reccomend these for sure and they are great in different sizes. These are a everyday occasion plate that I use for basic parties, elegant luncheons and also for continental breakfast days to save from clean up! Perfect little plate for serving cake at weddings and appetizers on our buffet station. You can't beat the price either will be ordering more soon. We love using these plastic plates for special events for our parents at our school. They are super durable and make our events look more presentable. We also love the affordable prices. We used these for our recent wedding for appetizers and desserts and they were PERFECT. I'm glad I went with these over napkins that I had originally planned to use. And they're pretty, too! The reason I am giving four stars is because the rim is 1" making the plate only 4" really. They are sturdy and will look nice for a wedding as well. Again - great to have a full complement of plates and bowls to be able to coordinate. Looked great on the tables and the prices were fantastic! I found the 6" plates to be flimsier than the 7" plates. Several arrived cracked. I recommend only using for picnics, cookouts, family reunions etc. We appreciate your feedback! We’re sorry your plates arrived damaged. A Customer Solutions Representative will be contacting you soon. Thank you for the durability of the Clear plastic plates The plates were utilized for a large family reunion and buying in bulk large quantities saved a ton of money we Plan to order again for a June wedding . We have 1 less worry . Very very satisfied. These are very sharp looking plastic plates. Perfect size for appetizers or desserts, these look classy enough to serve even to your fanciest guests at a dinner party! These were a little flimsier than I expected, but they will do just fine for serving cake at my wedding. I only wish they did not have the three little symbols (circle, recycle symbol, and food-safe symbol) because that makes them less pretty. Used these small plates for appetizers and wedding cake. These plates match the larger plates and are classier than the regular plates I saw at the stores in my area. I would highly recommend these plates for use at weddings and parties. Clear disposable plates! 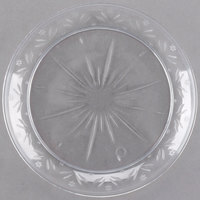 Choice crystal 6” clear plates in a pack of 20. There are a nice compact size or small portion size for breakfast and lunch with a quick clean up process. Attractive for a small disposable lunch plate. I would not recommend for a heavy meal. They will crack if you put too much food on then. I love these clear plates. They are well made and elegant. I use them for every dessert party that we have. They are inexpensive and the perfect size for a slice of pie or cake. These look and feel great. I plan to use them for serving cupcakes, and they are the perfect size. If you are serving cake, I would suggest going up a size. great product i usually buy the same product at a different store but this is more cost effective for me to purchase in bulk fewer trips means more savings for me. We used these at a graduation we catered. They work well but they are not as durable as their white vision waves I had used. It's almost like those clear plastic tumblers you can get made by Solo that can crack easily. Maybe they should use a thicker plastic because people had to double up the plates with the food that were served on them. This would be great for light very light salads. Almost ran out of plates bc of the doubling and the cracking and we didn't have heavy food. Other than that they were great to use for show. My clients love these plates. They look like nice glassware, they are sturdy, affordable and disposable. I have reordered multiple times and will continue to purchase in the future. i bought theses plates for my daughters wedding to use for the desserts. They are the perfect size, and very elegant. I also bought the 10" matching plates to go with it. I'm very pleased with the price and shipping was fast! Will definitely buy again for next occasion. These have a fancier look to them than I thought they would, I knew they looked nice in pictures, but they really didn't do them justice, I want more already! We used these small plates to serve dessert on at a rehearsal dinner. They were the perfect size for cookies and brownies. They were not as thick/heavy as some other clear plastic plates I have seen and used and a few cracked, however overall we were happy with them. These plates look surprisingly realistic. They make great dessert plates. These would be ideal for a dinner party where you don't want to deal with dishes afterwards. We order these time and time again. The price is great and they look so much better than Styrofoam plates. They are strong and durable and great for even the little hands to carry their food. Standard 6" clear plastic plates. Better value to buy from here than our food purveyor or at a discount club. And they ship them right to our warehouse. Great plate. I purchased these plates to match the dinner plates for my Rustic themed wedding reception, The little flowers are a cute touch to my decor. I wanted nice, large , yet disposable plates and these are exactly what I wanted. I purchased enought that I have extra for my holiday meals. Perfect for the wedding cake or dessert bar ! Arrived much sooner than expected and was surprised at the quality of the items. They will be used for a party being held in January. I Am so looking forwarding to using them. These are truly lovely. This product is only marginally more expensive than plain clear plastic plates, but hundreds of times better. The pictures can't do them justice. I ordered these plates to supplement the above plates. I love the fact that these plates could be purchased in bulk size and smaller size packages. I'm very pleased with this product. These clear plastic plates looked great with all the other decorations and accessories we had for my daughters wedding in August. They were sturdy and pretty on the cake table.